From hand drawn lettering, detailed illustrations or repeat patterns to personalized wedding invitations, flyer designs, website and blog banners or a cool paint in the kids room wall, I am happy to work with you on any of your design requirements whether you are a design studio, a small business or an individual looking for a bespoke service. Have a look through my portfolio to see the style of work I produce and if you would like to commission me do not hesitate to get in touch. I am available to offer my services in freelance graffiti, illustration and design works. Development of graphic elements and communication solutions, according to the needs of your business. Realization and implementation of branding projects branding and corporate identity. Communication plans and advertising. Through analog or digital, bitmap or vectorial, minimal or complex, realistic or surreal. It is illustrated the ideal imaginary to implement into communication solutions, advertising, editorial, merchandising, apparel… Illustration helps your brand to stand out. Do what you love, it's all about love! 2CarryOn love to recieve new challenges and would be happy to collaborate with you! First, we will discuss all the details of your project, including the preferences, the purposes, the timeline and the cost. Next I will move on to the design stage. Normally I produce several design ideas (two or three, it depends on the project type), for you to choose into a final idea. Next we move forward into the art’s and craft’s of your project. The project isn´t finished until all are happy. I was born in the summer of 1985 in Lisbon , and in the course of that year , my parents decided to move to Lousã, where I lived and studied until I was 8 years old. Only in 1994 returned to the capital. After a childhood marked by abuse in the style of former PIDE. With nine years was no longer a child, but a young man was angry and frustrated with the naivety lost, adult created by force. In Lisbon, the great metropolis, I passed a complicated integration, new life, new emotions and feelings; Without the violence and repression of feelings that was used; New repressions came, I needed to find something where unload all my rage, anger and frustration; increasingly alone, there were few friends and companions, I began to find on the white sheets of paper a comfort to my soul. Destroyed sheets of paper and books with characters, sketches, risks and more risks. In 1997, it was heard talking in Expo, Lisbon was running from end to end; Already knew like the back of my hand ; Watch faces, expressions, people run in their lives, and I stopped, watching every step. I started to pay attention to a sub-culture that was born in Portugal, the Graffiti. I’ve Heard stories, watch graffiti, throwUps, tags; That made sense to me. Draw in all spaces without limits; Being able to get messages to a huge audience. I felt, in this big searching that as the life, it was part of me, was stronger than me… I took the first steps on graffiti; Benfica was the area, the mecca of Bombing in the Capital, was where I lived and was where I met the first Portuguese writers. My routine has changed, thought only of paint, tagging and spread my message, I spent the whole day catching buses and subways, running the entire city… I recently had my heteronym (one of them) scattered everywhere; Shortly after the missions began to have another connection and meaning, bolder; Kept the street actions, but the train had other bites. Grappling with graffiti began to develop a taste for photography, integrating the photography club at my school. The new millennium was coming and I walked into Antonio Arroio, it was here that I began developing the whole creative process of making parts that was going as well as create new heteronyms for different types of action that was going materializing. 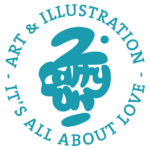 Today I am a graphic designer and illustrator, based in Lisbon. Do graffiti since 1997, and I am a designer with influence on the streets. Paint the walls was a hobby that developed a huge passion for typography, and how a love never comes alone and live in an age where we fell in love around every corner, is common… Colors, painting, drawing, vector, tattoos, ink on my hands , watercolor, silkscreen, photography, video… The passions are being born and living within each one… Just need to be fed… It is with this love and dedication that I try to live every day… it’s All About Love ! AKA – Who is who? Located in the heart of Benfica, 2CarryOn hosted his studio close to the place where, in ’97 began painting. A small but cosy space, where the organization is thought to the millimetre. The space works as a open studio environment, and in recent years received emerging artists as MAMB. 2CarryOn Studio has been the basis for projects such as the Cultural and Artistic Association – BENFICARTE. Ask for a quote, or simply drop a hi! Newsletter contact for fresh news. If you want to buy something.